Bike commuting, should I try it? Bike to Work Day is coming up next Friday, May 21, so I thought this would be a perfect time to meet bike commuters and find out how they get the adrenaline to pedal to their workplace on a regular basis. This morning, I met Andy Larson at the Montlake Freeway Pass bus stop, a hot spot for bike commuters waiting to catch a bus to cross to the Eastside — the S-520 bridge doesn’t have a bike lane. Larson, who commutes from the University District to Redmond, said he’s no athlete and doesn’t ride a bike for exercise. “Look at me,” he said, pointing to his loose jeans and shoes, not the kind of made-for-cycling outfit that other bike commuters wear. After the incident, Larson got some advice from other riders: get a cheap bike and a nice lock. But he’s not taking chances and now puts it on the bus, which has racks on the front specially designed to hold up to three bikes. Larson said traffic plays a big part in his commuting choice. If he drove, it could take him one hour and-a-half just to get back in the afternoon rush hour, he said. 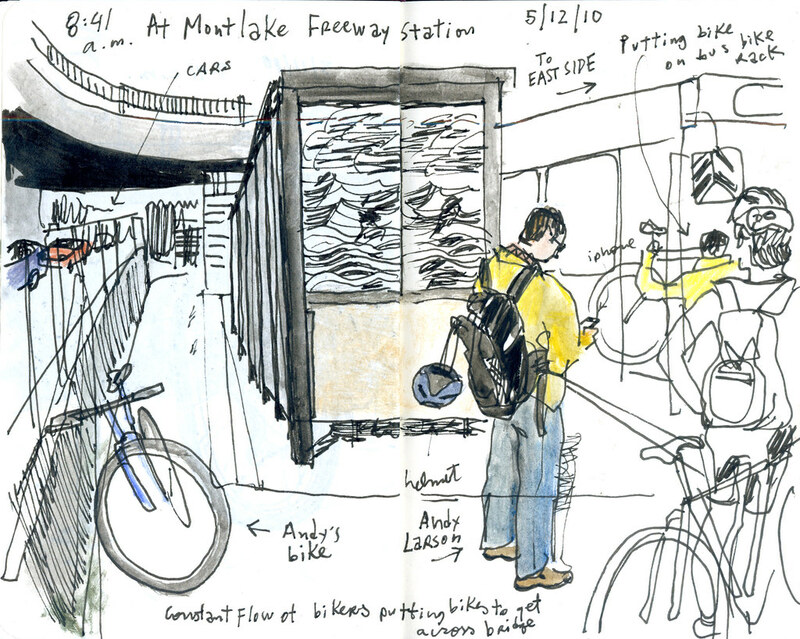 Biking and riding the bus makes each way about 45 minutes. By the time I finished my sketch and Larson got on his bus, about seven other bikers had arrived. One of them was Caitlin Kehoe, who had biked from Fremont and needed to be at work in Redmond by 10 a.m. I’ll tell you more about Caitlin’s commute Thursday. Are you a bike commuter? I’d love to hear your story. What’s your commute like? Why do you bike? I’m fine with driving to a park and ride and taking a bus. Why should I consider biking?